• I'm missing out on Tokyo Game Market in May 2019 as it takes place the same weekend as BGG.Spring, but I'm still following announcements from JP designers and publishers to see what they plan to introduce at the show. —"Shobai" All Right (商売往来), a card and resource management game set in a fictitious commercial city. —Across the United States (アクロス・ザ・ユナイテッドステイツ), a railway and network building game set in the 19th century. Both titles appear to be larger games given their price tags (¥3,000 and ¥4,500 respectively). Ideally OKAZU will drop rules in the future, and we'll get a better idea of what's involved with these designs. • Another new title coming at TGM in May 2019 is みんなのお茶請け, which translates as something like "Everyone's Served" or "Tea Ceremony for All". I know nothing about this design from Hammer that will be released from Hammer Works beyond what I've just said. Sometimes you just have to look at a box and use your feelings for lemurs as a guide. Shun or subscribe? • 三ツ星ショコラティエ (Three-Star Chocolatier) was actually released at the Game Market in late 2018, but I hadn't heard of it previously and I'm guessing the same is true for you. In this game from designer/publisher ななつむ (nanatsumu), players roll dice to produce chocolate according to the pips, possibly using topping cards to create chocolate flavored like strawberry, banana, and other flavors. Your goal is to sell chocolates to customers, who want particular arrangements and flavors of treats. Skill cards can help you gain additional abilities during the game. As you satisfy the demands from customers, you receive stars, and the first player to collect three large stars wins. 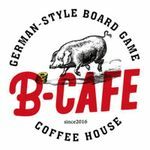 In Kanban Menu, each player, as owner of a small café, tries to develop their specialty to establish the best café in town. Use material cards to make your specialties and gain good reputations (in the form of victory points, a.k.a. VPs). The player with the most VP at the end of the game wins. In the short summer of the Southern Alps, animals live in a corral. In Peter's Two Sheep Dogs, players act as two sheep dogs, calling the animals with a loud voice and chasing off the wolf. Compete to be Peter's best sheep dog by herding the animals from the grassland, into the fence, and finally to the hut. The player aims to become a sheep dog and collect many animals into their navery. 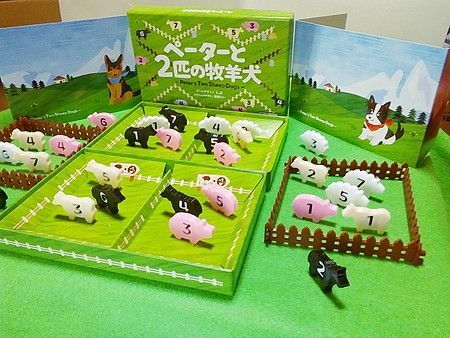 Three livestock animals — sheep, pig, cow — score points, while the wolf eats the livestock and eliminates points. As a result, players balance moving the wolves to threaten the opponent while also gathering livestock for themselves. However, because both trick-taking and mancala rules are mixed together, it will not be easy. Basically winning a trick allows players to collect animals in their grasslands. The player who loses the trick picks one of their grasslands and performs the movement action. If you can chase animals perfectly toward your or your opponent's goal fence, you can gain additional action opportunities and an even better score. During the game you have opportunities for scorings in spring and summer, and if the score obtained in summer is lower than the score obtained in spring, the summer score becomes 0 points. However, if the score obtained in summer is more than twice the score of spring, your spring score is doubled. If you want more details on how Peter's Two Sheep Dogs plays, James Nathan posted a detailed overview of the game on Opinionated Gamers, and Lorna posted a shorter overview here on BGG.